HIALEAH, FL�FEBRUARY 28, 2016�Carters Sixty Six dug in gamely as stablemate Ec Jet One battled back after getting bumped at the start to finish in a dead-heat Sunday afternoon in the $204,265 South Florida Quarter Horse Derby at Hialeah Park. Sprinster was moved to third after Genovese was disqualified and placed ninth for interference. The Judd Kearl trainees could not be separated at the wire as they raced over the 440-yard course in :21.717 seconds, a 93 speed index into a 10 mph crosswind. 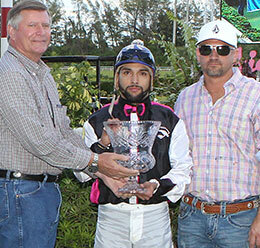 Enrique Carrion's homebred Ec Jet One brought a two-race win streak into the derby final that included a win in the $390,935 Hialeah Derby on January 17. Ridden by jockey Rodrigo Vallejo, the son of leading second crop sire The Louisiana Cartel has compiled an (8) 6-0-1 record and the $61,280 winner's split today boosted his earnings total to $353,649. The bay Texas-bred is out of Pretty Girl Perry, by Mr Jess Perry. FQHRA President Ron Smith presents the winning stakes trophy to the winning connections of Ec Jet One including Alejandra Carrion, jockey Rodrigo Vallejo and trainer Judd Kearl. 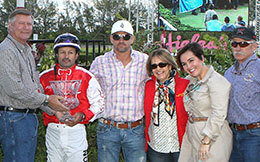 Kearl and Vallejo teamed to win three stakes (see related story) on Hialeah Park's Sunday card. Kearl conditions the multiple stakes winner Carters Sixty Six for owner Byron Gardner. Also a three-time winner at the current Hialeah meet, Carters Sixty Six entered the derby final off a win in the El Nino Stakes on January 17. Michael Samples bred the daughter of Carters Cartel in Kansas from the Sixarun mare Going Sixty Six. She has compiled a (9) 3-0-3 record and pushed her earnings mark to $103,315. Trainer John Stinebaugh conditions Sprinster for Sunset Well Services, Inc. The daughter of multiple stakes sire FDD Dynasty is out of Mr Jess Perry mare Dash Of Perry. Edwuin Lujan had the riding assignment aboard the Texas bred filly. B/M Eiland and Harris Racing Stables, Inc. is the breeder. She doubled her earnings to $55,530 after picking up $23,512 for third. The aforementioned Genovese drifted out at the start interfering with Favored Fire who pushed into Ec Jet One. Completing the official order of finish were Satcha Wagoneer, Ahs Blazin Spirit, Ahs Corona, Love You Pappi, Favored Fire, Genovese and Highway. Hialeah Park closes out the final week of its 10-week 2015-16 live racing season with nine-race card closing day card on Monday February 29. First post is at 12:35 PM ET, parking and admission are always free of charge.